The rigging is taken directly from 60ft racing trimarans: a built-out main sail, a long overlap for the main sail, a large number of front sails and an extendable carbon fibre bowsprit. 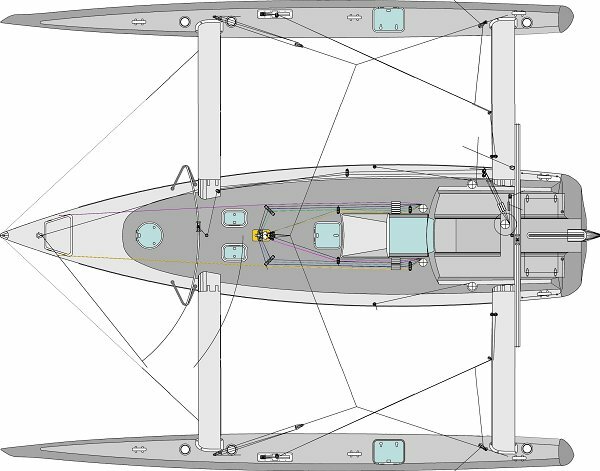 It allows many different trimming possibilities, one of which is a reduction of 1/42 for the mainsheet with a fine tune built into the boom. A removable baby stay for the “storm sail” is optional. The Trimax 1080 can easily be sailed single handedly. The most important lines come to a central winch mounted in the cockpit. A self tacking jib mounted on a boom is optional.